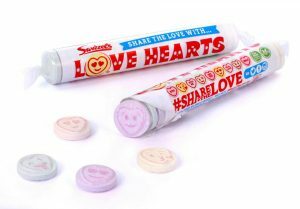 Confectionery manufacturer Swizzels who produces the iconic British sweets with messages of love ❤️ on, Love Hearts, is giving itself a modern makeover in the form of emojis 💝. Since their creation in 1954, Love Hearts have undergone a number of transformations 💓 to keep up with ever-changing language 💬. Outdated messages which have been dropped include, “Hey Daddio” and “Far Out” which were everyday sayings in the fifties and sixties but are no longer use 📆. In more recent times the UK has seen the additions of “Email Me” 📧 in the nineties and “Tweet Me” 🐦 in the noughties! Emojis were the next most natural step 👟. 11 of Britain’s favourite emojis will be added to packs of Love Hearts 💟, including the standard smiley 🙂, crying with laughter 😂, wink face 😉, kissing 😘, tongue out 😜, crying 😢, heart eyes 😍 and the sunglasses 😎 emoji. Which emoji would you like to see added to Love Hearts 💖? Post your answers in the comments below!